YOSHIKAWA, SAITAMA PREF. - It’s drawing time at this suburban nursery school in Saitama Prefecture, but instead of crayons, tiny fingers are tapping on colors on iPad screens and taking selfies. Digital schooling has arrived in a nation long known for its zealous commitment to the “three R’s of education,” or reading, writing and arithmetic. Coby Preschool in the town of Yoshikawa is among nearly 400 kindergartens and nursery schools in Japan that are using smartphone software applications called KitS and designed especially for preschoolers. Parents across the globe worry their children might fall behind, and Japan is no exception. The government has recently made strengthening technology education national policy even as it struggles to meet its goal of supplying one digital device — a computer or tablet — for every three children. With KitS, developed by Tokyo-based startup SmartEducation, children color birds and flowers that appear to come alive as 3D computer graphics. Children also draw various creatures that, when captured as computer images, swim or float around in virtual landscapes. In a recent session, children got a triangle image on their iPads and were asked to draw on it with digital colors, store that image, and draw another one to create a two-screen story. In the U.S., 98 percent of children age 8 and under have a mobile device in their homes, while 43 percent have their own tablet, according to The Genius of Play, an American program that researches education and play. That’s similar to Japan, where each adult has an average of more than one smartphone and about half of preschoolers have access to a mobile device, according to central government data. In many U.S., Asian and European preschools and elementary schools, teachers use technology to present stories, music and other information. Educators are also studying children’s social development through how they learn to share digital devices. 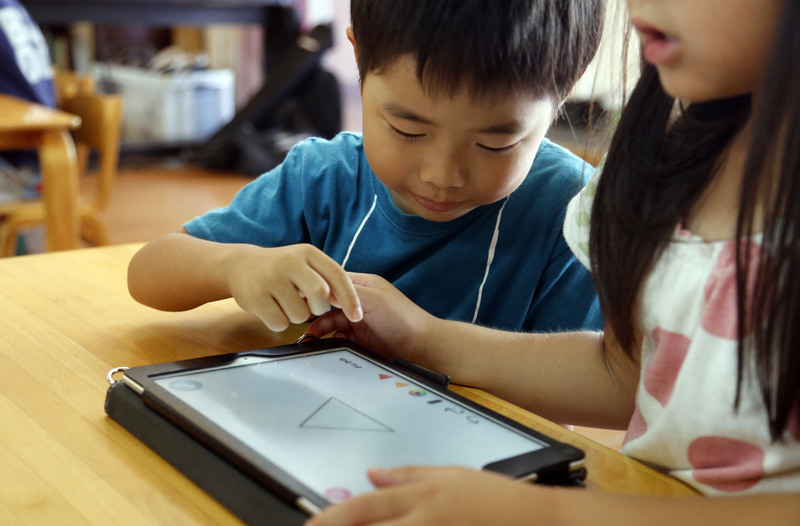 Much of what’s driving the adoption of tablets in U.S. preschools is a belief, founded or not, that an early start will make kids smarter at technology, said Patricia Cantor, a professor of early childhood education at Plymouth State University in New Hampshire. Experts have known for years that playing is how children learn, said Ken Seiter, executive vice president at The Toy Association, a nonprofit that represents businesses that design, produce, license and deliver youth-entertainment products. Toys can teach toddlers simple programming or use augmented reality to bring story characters digitally alive, said Seiter, whose organization spearheads The Genius of Play. Japan’s classrooms tend to be more structured than in the West, with students often acting in unison as they line up, bow and chant together. Children tend to be passive, and the emphasis is on the group rather than the individual. Youngsters, even some preschoolers, attend extracurricular cram schools. Yuhei Yamauchi, a professor of information studies at the University of Tokyo and a KitS adviser, sees practical benefits. By the time today’s 5-year-olds start work, a large majority of jobs will require computer skills. Given Japan’s shrinking population, people may work into their 80s, shifting jobs several times. Digital skills are more critical than ever, he said. Experts warn that staring for too long at screens can damage eyesight and deter creative thinking. It’s a complex problem, since children may see their parents immersed in devices themselves. KitS limits each session on the iPad to 15 minutes. Classes are held just 30 times a year. At the preschool in Yoshikawa, a sleepy Tokyo bedroom community ringed by lush rice paddies, the children have mastered time-lapse photography using their iPads. Preschools like Coby are subsidized by local governments. Fees, including meals, are on a sliding scale based on income with the poorest families paying nothing. Each preschool pays SmartEducation an initial ¥500,000, not including the cost of the iPads, and ¥30,000 ($265) more a month for maintenance. The cost for training teachers is included. Students say they enjoy using the iPad and use the message function to send their parents photos of themselves in action and share trailers of their upcoming performances.